Currently, M.G. Newell has three locations: Greensboro, NC, Louisville, KY, and Nashville, TN. With the addition of the Louisville and Nashville divisions, the original M. G. Newell now functions as the corporate headquarters and houses the Greensboro division. 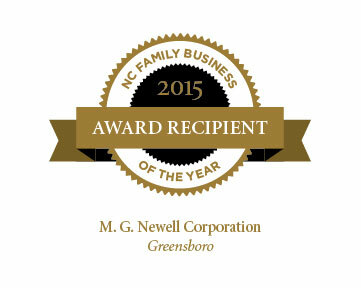 We are honored to have received the NC Family Business of the Year award for 2015 in the Century category.